The soft set theory proposed by Molodtsov is a recent mathematical approach for modeling uncertainty and vagueness. The main aim of this study is to introduce the concept of soft action by combining soft set theory with the action which is an important concept in dynamical systems theory. Moreover, different types of soft action are presented and some important characterizations are given. Finally, we define the concept of soft symmetric group and present the relation between the soft action and soft symmetric group, as a similar result to the classical Cayley's Theorem. 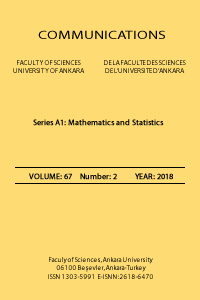 Atagun, A. O. and Sezgin, A., Soft substructures of rings, fields and modules, Computers and Math.with Appl., 61 (2011), 592-601. Molodtsov, D. A., Soft set theory-First results, Comput. Math. Appl., 37(4-5) (1999), 19-31. Aktas, H. and Cagman, N., Soft sets and soft groups, Inform. Sci., 77(13) (2007), 2726-2735. Rotman, J. J., An Introduction to the Theory of Groups. 4th ed. Springer, New York, 1995. Veress, L. A., Group actions on sets and automata theory, Applied Mathematics and Computation, 113(2-3) ( 2000), 289-304. Shabir, M. and Naz, M., On soft topological spaces, Comput. Math. Appl., 61(7) (2011), 1786-1799. Hirsch, M.W., Smale, S. and Devaney, R.L., Differential Equations, Dynamical Systems and an Introduction to Chaos, Elsevier, San Diego, CA, 2004. Maji, P. K., Biswas, R. and Roy, A. R., Soft set theory, Comput. Math. Appl., 45(4-5) (2003), 555-562. Smale, S., Differentiable Dynamical Systems, Bull. Amer. Math. Soc., 73 (1967), 747-817. Sardar, S. K. and Gupta, S., Soft category theory-an introduction, Journal of Hyperstructures, 2 (2013),118-135. Wagner, S., Free Group Actions from the Viewpoint of Dynamical Systems, Muenster J. of Math., 5(2012), 73-98. Shah, T. and Shaheen, S., Soft topological groups and rings, Ann. Fuzzy Math. Inform., 7(5)(2014), 725-743. Santos, W. F. and Rittatore, A., Actions and Invariants of Algebraic Groups, CRC press, 2005.